The feeling of having another happy and satisfied customer to talk about is amazing – this time it is Montana Silversmiths, one of the largest suppliers of western jewelry, watches, and legendary buckles to the industry. 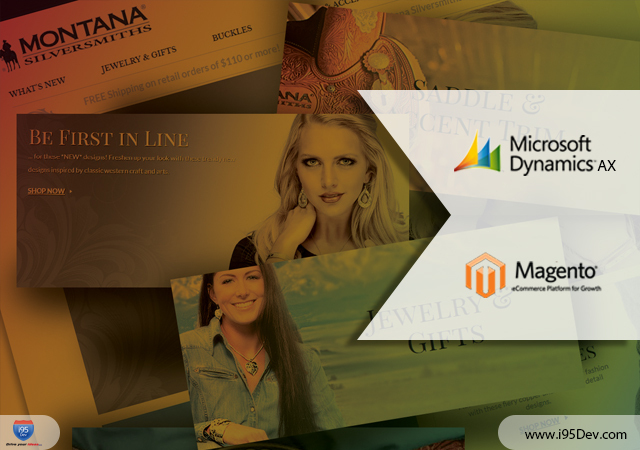 We are really happy and proud to announce the successful implementation of Magento and Microsoft Dynamics AX integration for Montana Silversmiths. Nestled in the town of Columbus, MT, Montana Silversmiths is the manufacturer of choice for every important rodeo in North America, and every discerning buckle buying American. They are really passionate about their products and known for producing products of finest quality and beauty – each of their creation is touched by as many as twenty-five caring sets of hands before being packaged. Montana Silversmiths reached their customers through a network of distributors and suppliers, but they wanted to share this passion of theirs directly with customers. They had an eCommerce store powered by Magento for this, but their existing set up of multiple disconnected systems was costing them a lot of time and money. Montana Silversmiths partnered with i95Dev to help them manage their B2C customers easily, expand their reach to international markets and move their B2B customers to the eCommerce platform without increasing their overhead significantly and without compromising on the customer experience (both B2B and B2C). After thoroughly understanding Montana Silversmiths’ requirements and existing processes we decided to approach the project in a phased manner. In first phase, Montana Silversmiths’ Magento eCommerce store was integrated with their Dynamics AX ERP system, while incorporating all their custom requirements, to streamline their order fulfillment process; decreasing the operational overhead required to manage and maintain their eCommerce store and B2C customers. In first phase, a number of customizations were also accommodate based on Montana Silversmiths’ business processes like mapping all eCommerce customers and orders to a single account created specifically for eCommerce customers in Dynamics AX, custom order workflow for orders with customized items, tax support with Avalara integration, supporting partial shipment & shipment information sync and more. In the second phase, which is set to go live very soon, we are working with Montana Silversmiths to support international orders using Bongo International. The subsequent phases will then focus on their B2B requirements.